If an eagle license plate is on your Christmas wish list, we might be able to help. 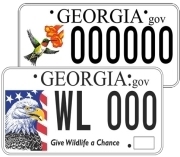 Take this brief survey about Georgia’s wildlife license plates before Wednesday, Dec. 3. We’ll pick one participant at random to receive a flying eagle plate, and email the winner by Friday, Dec. 5. There are only five questions. 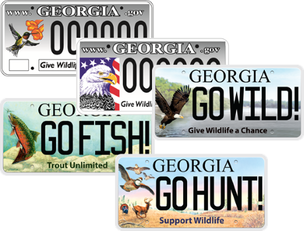 All focus on changes in the pricing for wildlife license plates and the support these tags provide for wildlife conservation in our state. Again, you can take the survey here. Responses are anonymous. Only one response per recipient, please. Thank you for your interest and support in conserving Georgia’s wildlife and wild places! Learn about buying or renewing a wildlife tag on our website. It’s almost as easy as taking our survey! It’s no mystery where the Pigeon Mountain salamander can be found – just look in the name. This aptly-titled amphibian lives among rock outcroppings and limestone caves on the eastern slope of Pigeon Mountain in northwest Georgia. Yet despite the species’ abundance in this well-defined range, many aspects concerning the life history and behavior of Plethodon petraeus remain a mystery. 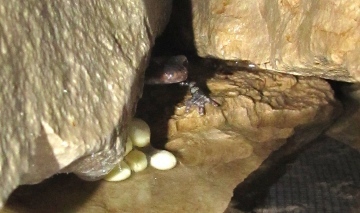 That's why the eggs laid recently by a Pigeon Mountain salamander at Toledo Zoo in Ohio caused a stir among biologists. The clutch that zookeeper Tim Herman found in the specially designed terrarium late last month is the first documented nest of Pigeon Mountain salamanders. And although perhaps an anomaly of captivity, Herman said the location of the eggs near water was unexpected. The eggs later fell into the water and were abandoned. Yet the clutch still appears to be developing normally and the mother had been attending it, promising signs for future breeding success. Herman, who has been successful with the captive husbandry and reproduction of several salamander species, has been working with Pigeon Mountain salamanders for five years. 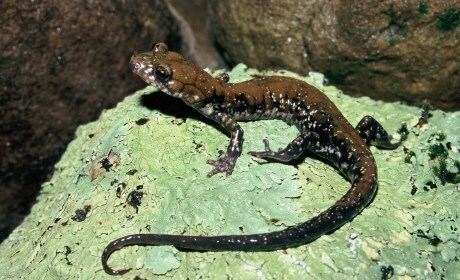 He collected the Georgia “sallies” with DNR’s permission and the help of John Jensen, a Nongame Conservation Section senior wildlife biologist who has been surveying the salamanders in caves on Pigeon Mountain for more than 15 years. Jensen said the nesting attempt could provide insight into the species’ reproductive biology, of which little is known. Work with captive breeding could also yield information on hatchling growth and development, which would help biologists better understand the species’ needs at all life stages. While abundant in the few locations where they’re found, Pigeon Mountain salamanders are state-protected as a rare species because of their severely limited range, a factor that makes them vulnerable to disease, climate change and habitat alteration. Continuing efforts to learn more about these elusive salamanders in captivity could prove invaluable in conserving them in the wild at Pigeon Mountain. Size: Large terrestrial salamanders that grow up to 7 inches long. Coloration: Adults have irregularly-bordered reddish-brown, brown or olive-brown dorsal pattern on head, back and anterior portion of tail. Sides, legs and tail are mostly black with sparsely scattered, white and brassy spots. Range: Known to occur only on Pigeon Mountain's eastern slope, in Walker and Chattooga counties. Diet: Favor beetles and ants, but also eat other invertebrates. History: DNR employee Carol Ruckdeschel discovered one in a cave entrance in 1972. Description of the species followed its rediscovery in 1986. In the hills of Talbot, Upson and Meriwether counties, landowners are working to restore rare montane longleaf pine ecosystems. At the heart of the effort is Sprewell Bluff Wildlife Management Area, a stronghold of old-growth montane, or mountain, longleaf. Some longleaf on the middle Georgia WMA are more than 400 years old. Five natural communities rated globally rare have been documented here, two of them new to science. Working with DNR, area landowners including Plum Creek, Campbell Global and CatchMark Timber Trust are reintroducing the fire these trees need and bringing back longleaf to these rugged mountains. Montane longleaf is an extremely rare type of longleaf pine forest and a high-priority habitat in Georgia’s State Wildlife Action Plan, a comprehensive strategy for conserving native wildlife and natural habitats statewide. Montane stands at Sprewell Bluff include oak woodland and glade habitats, a unique mix rich in rare plants and animals such as turkeybeard, a rare lily that blooms with 4- to 5-foot-tall flowers after a fire (left); Carolina larkspur, a beautiful blue spring wildflower; eastern coral snake, the only population north of the Fall Line; and, northern bobwhites and other declining species. Adjacent to the WMA, the three timber companies are also working to restore montane longleaf – joining with DNR on prescribed fires, replanting longleaf in key areas and identifying rare natural communities for protection. Nathan Klaus, a Nongame Conservation Section senior wildlife biologist who helps manage Sprewell Bluff, considers the WMA a keen example of DNR engaging neighboring landowners for conservation. 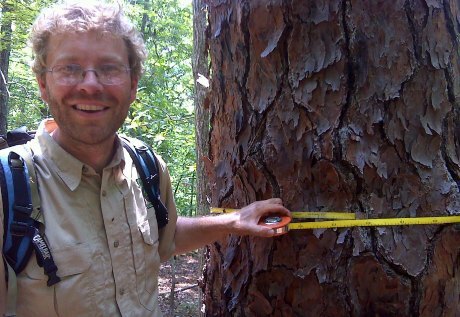 Klaus also believes montane longleaf ecosystems can be conserved while managing timber. “It requires some extra effort. These systems need regular fire, herbicide use needs to be dialed back and the old trees need to be protected, but these landowners are doing these things and more. Sprewell Bluff-area surveys in 2012 documented new communities considered globally rare, including hog plum glades, which are unusual grasslands found along rocky ridgetops that often harbor rare plants, and longleaf pine heath bluffs, open-canopied forests found on steep cliff sides that have a rich understory of mountain laurel, rhododendron, blueberries and other heath species. Gov. Nathan Deal recognized Plum Creek and CatchMark Timber Trust, along with Georgia Power, in February as 2013 partners in DNR’s Forestry for Wildlife Partnership. This voluntary program promotes sustainable forest and wildlife conservation in corporate forestry practices. A survey for Georgia alder, a rare subspecies of seaside alder, turned up more plants than thought in Bartow County’s Drummond Swamp. 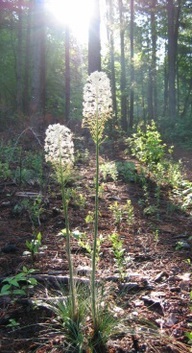 The helicopter search of the 200-acre swamp, the only known site of the species, increased the documented number of areas dense with Georgia alder from two to six and estimated the total count of stems at a half-million to 750,000. Speaking of amphibians, DNR senior wildlife biologist John Jensen snapped photos of this female marbled salamander (left) attending eggs in the Savannah River floodplain on Yuchi Wildlife Management Area, just south of Augusta. 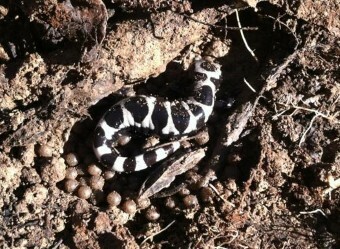 Jensen saw about 20 marbled salamanders in all. Conservation won big during the mid-term elections. According to media reports and The Trust for Public Land, voters in 35 jurisdictions from South Carolina to New Mexico passed measures conserving land to the tune of about $13 billion, a record high during at least the last 25 years. Included: a Florida amendment that dedicates $18 billion from an existing real estate tax to conservation over the next 20 years, with half going to new land conservation (and making up the brunt of the $13 billion estimate nationwide). What kind of experience is BOW? Blogger Candy Cook, who joined the recent Becoming an Outdoors-Woman workshop at Charlie Elliott Wildlife Center, rates it a “truly life-changing experience that I believe every woman should attend at least once.” Read her post. DNR’s Alan Isler and Danny Smith recently harvested about 100 pounds of groundcover seed on Silver Lake Wildlife Management Area, near Bainbridge. The seed from native grasses, legumes and forbs will be planted on other southwest Georgia WMAs where intensive timber management has eradicated some species. The Southeast Aquatic Resources Partnership has been quietly but steadily restoring fish and related habitats for 10 years across the region and in Georgia, from springs in the lower Flint River to brook trout streams on the Chattahoochee National Forest. Check out the organization’s report celebrating a decade of success. Names in the news: John Bowers, chief of DNR’s Game Management Section, recently received The Wildlife Society’s annual Special Recognition Service Award. The honor recognizes exceptional service to the wildlife conservation profession by a person or group. Savannah Country Day School teacher Bill Eswine (left, in blue) and his students learned more about pitcherplant bogs from DNR natural resources biologist Jacob Thompson during a Nov. 19 ceremony honoring Eswine as recipient of this year’s $1,000 Teaching Conservation grant. 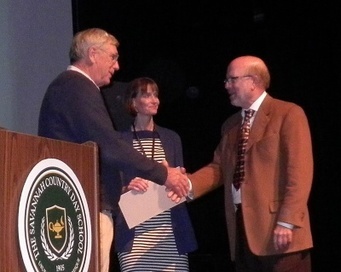 Jim Kluttz (right), a board of directors member of The Environmental Resources Network, which sponsors the grant, joined the presentation along with Dr. Joan Kahn, who also teaches science at Savannah Country Day’s Lower School. Georgia State Parks Director Becky Kelley has received a lifetime achievement entry into the Georgia Recreation and Parks Association’s Hall of Fame. Induction marks extraordinary contributions to the recreation, park and conservation movements in the state. Feb. 6-7 – Weekend for Wildlife (fundraiser for the Georgia Nongame Wildlife Conservation Fund), Sea Island. April 28-29 – 2015 Georgia Water Resources Conference, UGA Center for Continuing Education, Athens.